Home is a no-go today. Blah. SO we are taking her to 1/2 strength again for the day, thinking that her belly isn’t 100% yet (which makes sense, since mine still gets a little so-so still too!) We’ll go to full-strength tomorrow, and should be able to go home. Possible GOOD news though. 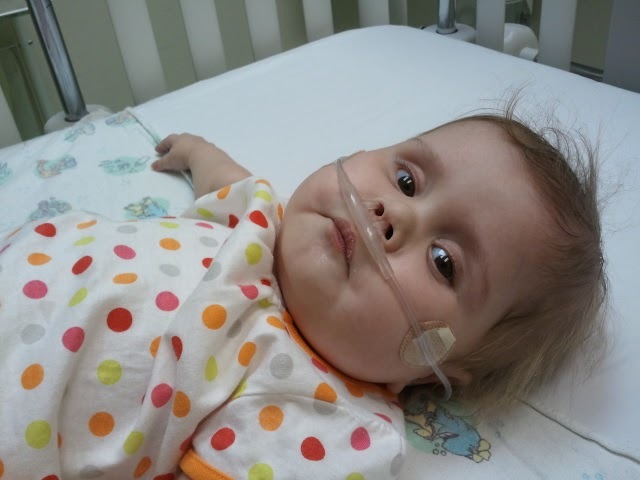 We were scheduled for another swallow study on this coming Monday to try and see if we could get her approved for “liquids” by mouth to try, since in her last swallow study, she had a paralyzed vocal chord so was only approved for purees. Talked to speech therapy today, and they are going to try and see if we can’t do her swallow study in the morning while we are in the hospital anyway, to prevent having to do it outpatient! Mommy is SO SO SO all for that! If we have to be here, to get something out of the way is better than nothing! Watching Price is Right with Mom: Priceless! Annabelle is officially “weaned” from “daytime” oxygen. Since the hospital has MUCH better O2 monitors, we were able to tell exactly how FABULOUS Annabelle is doing off her oxygen, so except at night and naptime, she is breathing completely on her own!!! A HUGE HUGE praise! At the hospital the other day, after getting multiple texts and phone calls about my sick family and then getting sick myself, I couldn’t help but get a irritated. Yes. We’ve been through SO SO SO much worse this past year, and through it all, I don’t think I once really felt “irritated” at God until now. The feeling didn’t last long. I knew I was being stupid. God did not cause this, and while He did allow it, stomach bugs happen. And if I’d made my kids wash their hands more, it probably wouldn’t have spread like it did. So really, it wasn’t God’s fault at all. But MAN I was just frustrated. It made me realize though, how many times I do that. I trust God with the BIG things, but the little things is where I get tripped up. 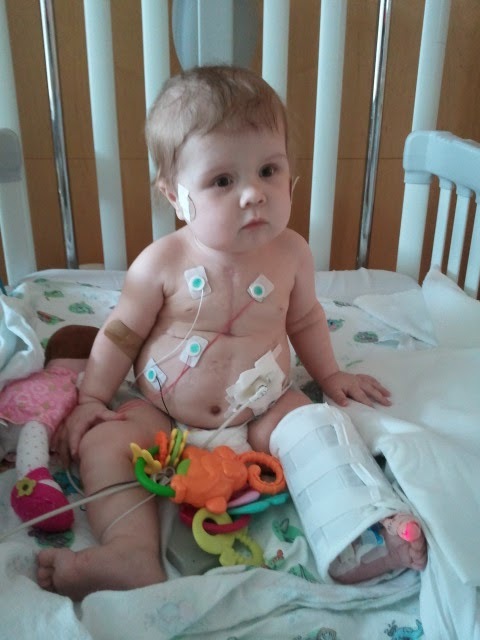 Four days in the hospital for diarrhea is NOTHING compared to the other 334 days she was in the hospital for severe heart issues. I know I’m 2 days late with the 9/11 analogy, but it reminds me of our nation after that horrible, awful day. It took something that huge to make a lot people flock to churches and get on their knees. It didn’t last though for most. All the “lesser” things invaded and as a nation, I think we’re almost MORE unGodly now than we were before. And that absolutely breaks my heart. I’m not one of those people who declare that God “brought his wrath upon our nation” with such an event. Really, a bunch of radical extremists brought THEIR wrath on our nation. I do think, however, God used something horrible to draw his children to him. There is much more I could say, but I’ll end with this. Let God be your God in the big things and little things. Don’t only go to him when something horrible happens. He wants to be your peace, strength, and cornerstone in every single part of your life. A special Happy 1st Birthday to sweet Baby James in heaven today. YOU, sweet little love, were a BIG thing in my life last year, as was your momma. You are forever missed, and today, we remember you, the strong fight you fought, and your amazing life you lived, even though it was much shorter than any of us ever imagined. Your life and home-going taught me SO SO much, as did your sweet Momma and wonderful Daddy. Please keep Tosha and Todd, James’ parents, as well as his older sister and brother, in your prayers today. Yay!!! for being off oxygen during the day! What wonderful news. It probably won't be long until she won't need it at all. Thanks for the reminder of letting God be God in our lives in the small and big things. He showed me His presence yesterday. Long story short, my husband was offered the job he had been laid-off from earlier in the year. He decided to go back to it since he is unhappy with his current job. This is so not what I wanted. The benefits he has with his current job are so wonderful and what he had with his old job … well, lets just say they were severely lacking. This broke my heart but God started ministering to me through music. For about 20 minutes on K-LOVE, the songs were as if they were written specifically for me in my situation. Your post today was another reminder of God's love and mercy. I need to be trusting in Him and not my husband, jobs or insurance companies! I will be praying for James' family today. It is so sad to think about those who lost their battle here on earth but I believe they are in the arms of the Saviour. We continue to pray for you and your family. May God bless. 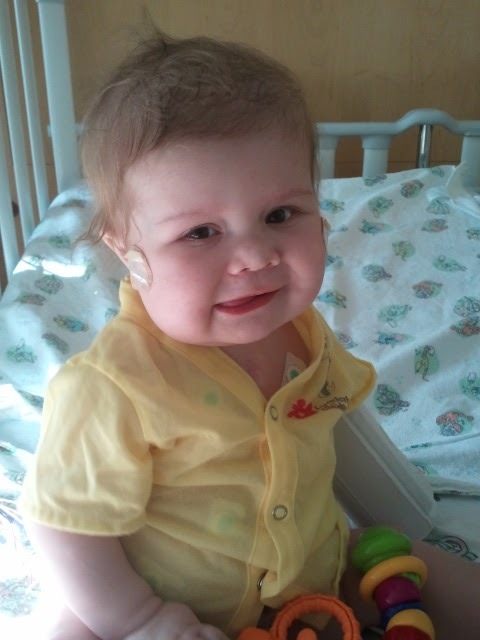 It's amazing to see what fluids can do … Annabelle looks so so much better now!! Happy Birthday to baby James! Praying for his family!